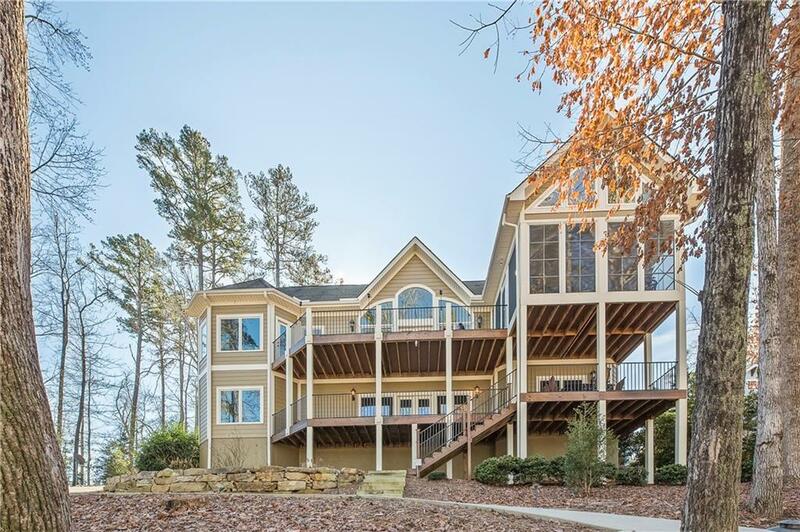 Welcome to this Stunning Lake Keowee Waterfront Home located in Riverstone, a subdivision of newer homes conveniently located to Seneca and Clemson. Built in 2007 the open concept spaces were designed with comfortable lake living in mind and abundance of picture windows to enjoy the beautiful lake views. 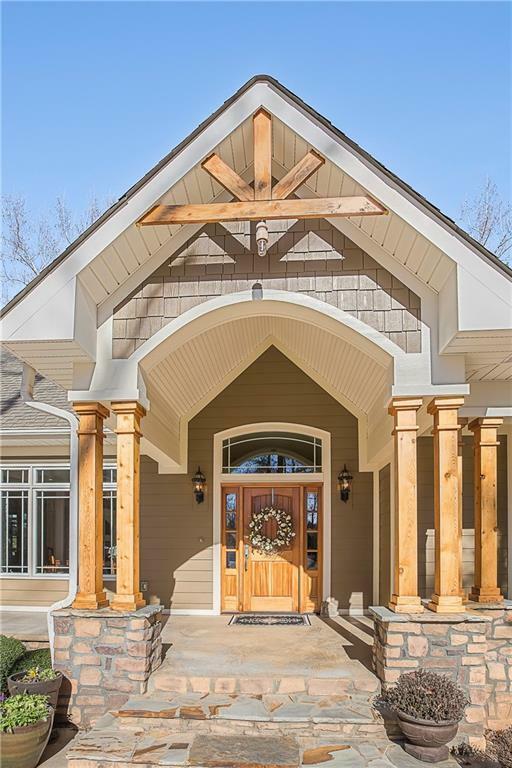 The over 4300 sq ft 4 BD / 4 BA craftsman style flows seamlessly one room into the other with the dining room completely open to the living room, kitchen, & breakfast room. A three seasons porch opens from the breakfast room and on to the expansive multi-level deck perfect for entertaining. Special features include hardwood floors, custom moldings, expansive ceilings, surround sound system, enclosed TV cabinet above gas fireplace, composite decking, and wrought iron railings. Kitchen is a cooks dream with multiple ovens, gas cook top, center island, pass through wet bar, and abundance of cabinets with custom built ins for storage. Large master suite on main floor boasts high multi-tray ceilings, soft lighting, and exterior access to deck. Dual custom walk in closets lead to luxurious bath with jetted tub. Three additional guest rooms and three full baths give guests plenty of privacy. New en-suite guest room is located over garage and two others in the walkout basement which share a jack-n-jill bath. Rooms have closets big enough for cribs. Multi-purpose room could be used for 5th bedroom, exercise, or crafts. Spacious recreation room offers a gathering space for family and friends and with over 1000 sq ft of unfinished space you will never lack for storage or workshop area, even a perfect space to create a wine cellar. Easy exterior doors make storing lake toys a breeze. 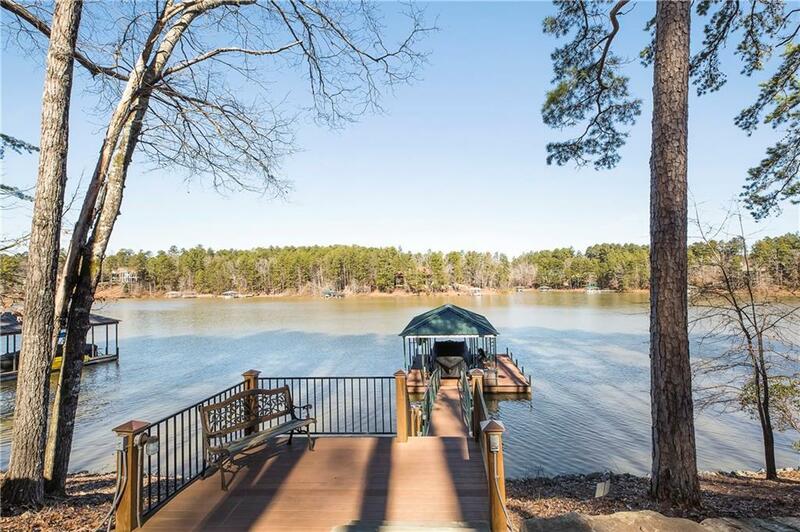 Owners have thought of everything and added paved paths around both sides of home that extend to lakeside fire pit area and covered slip dock with boat lift. Landscaping is low maintenance with custom lighting to showcase the exterior. Always room for parking extra vehicles in the over sized garage and extra parking pad. Riverstone has a park area with pavilion, playground and walking trail. Also a subdivision boat ramp if needed for convenience.